The large banks are not giving up easily, but it looks like the market is turning on them. Both bonds yields and oil prices are headed higher, which means that the market is convinced of one thing: INFLATION. Go back to 1971 and study the period when inflation raged last. You’ll clearly see that oil prices went through the roof. 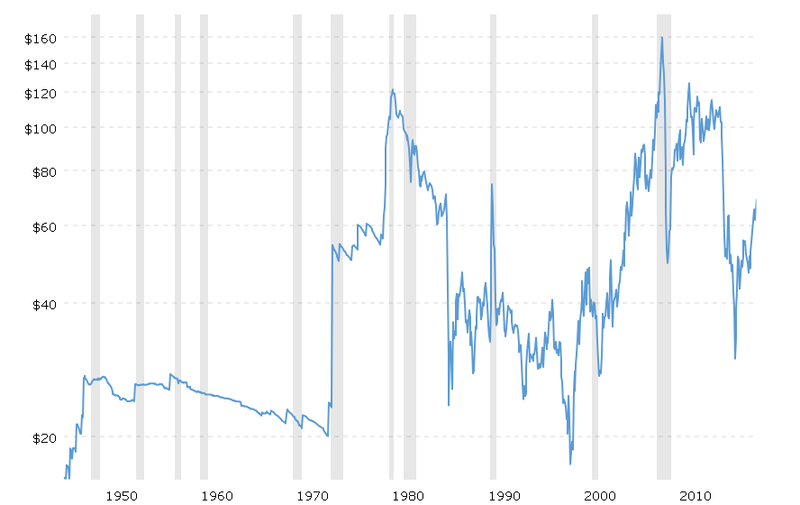 Then, look at the era leading up to the Dot.Com bubble, when gold bottomed, and you’ll notice oil prices did as well. As it stands, oil prices hit bottom at $26 per barrel and have tripled since. When oil prices were trading at $35, Wealth Research Group had pulled the trigger on Chevron, as an ideal dividend-payer – Chevron shares were priced at $84 at the time. Today, they’re selling for $123 already (a 46% return). You see, two years ago, thanks to technological advancements with shale oil fracking and because of slow growth in the global economy, there was a glut of crude, but the U.S. economy is recovering right now, especially at inner America (Oklahoma, Texas, Michigan among others). Oil is also highly volatile when geopolitical events transpire. Silver already traded above $17.25 last week, while gold pierced through the $1,360 mark, so the large banks involved in the price suppression schemes, leveraged up and hammered down prices again. This is normal, but with higher oil prices, it’s also risky. It’s their most considerable ongoing expense, and it will force miners to jack-up prices. This means that companies, which are sitting on gold ounces, but are NOT yet in production, will see the project’s value rise, while NOTHING changes for their expense columns. Development-stage companies do not have large energy costs at all. For them, any gain in spot price is an addition to their equity position. There’s even a bigger play there, though. Higher oil prices give auto manufacturers more incentive to push their electric vehicle assembly lines into production, since consumers want to pay less at the pump. Wealth Research Group will be publishing a documentary on the electric vehicles global revolution and what it means for investors in the coming days. Oil prices are the best gauge for consumer inflation because it impacts gasoline expenses for commuters, but it also makes the mining of all raw materials more expensive. At the same time as gasoline gets expensive, we’re seeing small businesses thriving under Trump, so wages are also in an uptrend. From every angle, price inflation is engulfing consumers, so we could be heading into a blow-off top rally in all asset classes, effective immediately. The last one occurred in 2007, as stocks, commodities, and bonds surged in unison. Take a look at the predictability of the precious metals cycles. Every five to six years, they make their bullish moves. The current bull market in the spot price began in December 2015, so we’re 30 months into it. 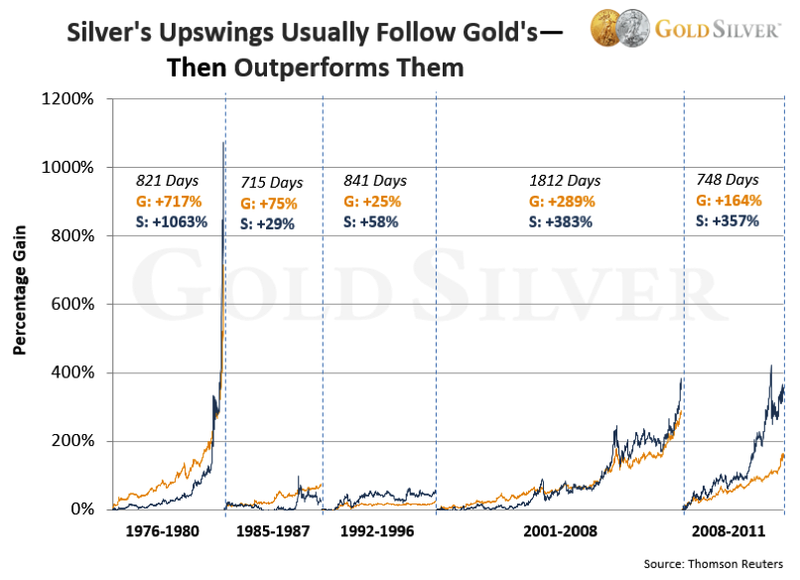 What this chart clearly shows is that silver outperforms gold every time, but in the past two and a half years, it is gold, which is taking the lead. In other words, the bull market still has legs to go. Now, looking at previous cycles, we also know that the junior mining sector begins to outperform the commodities at later stages as well. The inevitable conclusion, therefore, is that this is FIRST BASE for commodities. The second, equally important takeaway from this chart is that precious metals bull markets are short, so being cashed-up and prepared is a prerequisite. In the past three months, I’ve doubled down on my savings routine and funneled a significant amount of cash into my brokerage account. Watch oil prices to know when to become aggressive, but remember that $80 per barrel is the technical signal for the metals. High-Yield: Wealth Research Group is extremely bullish on MLPs. This asset class is cheap, ignored, and is distributing massive yield. 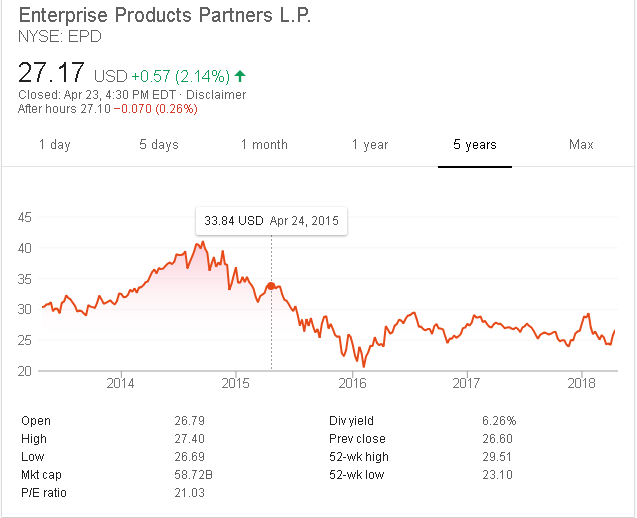 Personally, I own Buckeye Partners, which is the dominant player, and Enterprise Products Partners. As you can see, it yields over 6% and is half the price it was a couple of years ago. Gold Juniors: My most concentrated position is with Keith Neumeyer’s First Mining Gold. The near-term catalysts are higher gold prices and drill results in the Goldlund project. L Brands SHORT Position: Higher oil prices, coupled with Amazon’s retail take-over make for an ideal way to profit from price inflation. 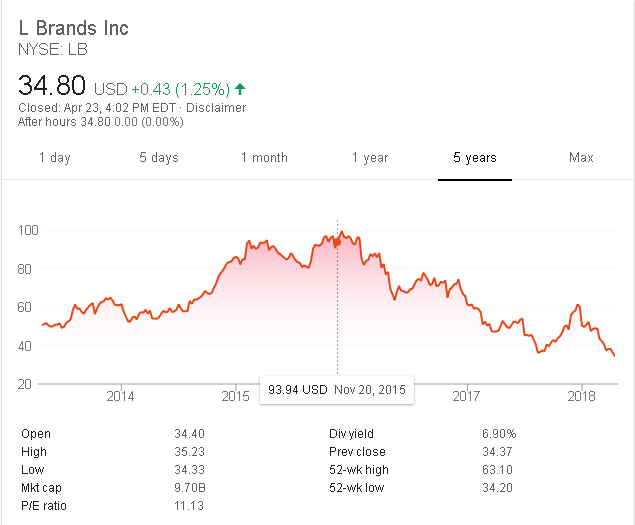 L Brands owns Victoria’s Secret, as well as Bed, Bath and Beyond, and shorting it since the end of 2015 (when the FED raised rates for the first time) has been a moneymaker. It’s down close to 50%, which makes it a sophisticated hedge; using profits from this trade helps build a cash position for mining shares. COBALT: This is the aggressive trade to execute. No industry is growing as quickly as electric vehicles, but cobalt is its bottleneck problem. Sourcing it from the Congo is creating all sorts of human rights issues, so other countries will have to step up their game. In 2017, Wealth Research Group covered a pure-play cobalt stock, which took-off at CAD$0.63, and we alerted to take profits at CAD$1.50, which is still its all-time high, so our timing was spot-on in hindsight. We have spent weeks looking at all the various angles to enter this sector again and found a company, which could double in months, just like our 2017 pick did. I’ll have the complete overview wrapped-up in a matter of days, as I’m due to speak with the company’s chief geological authority today.